Strain 3.5.1 was isolated from soils of the Republic of Tatarstan, Russia, on the basis of presence of a high phytate-degrading activity. Strains with such activities attract special interest because of its potential use as feed additives and natural manures. 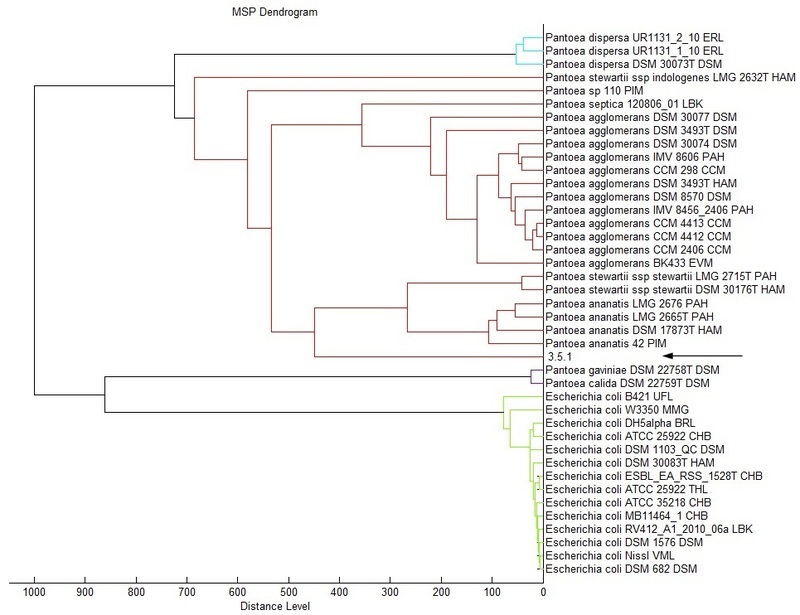 Strain 3.5.1 harbors a 99 % 16S rRNA nucleotide sequence similarity to different Pantoea species (P. vagans, P. ananatis, P. agglomerans, P. anthophila and Pantoea sp.) and exhibits unique biochemical properties that do not allow strain identification up to species. Moreover, the strain 3.5.1 shows a low ANI and MALDI-TOF Mass Spectrometry scores. Thus, it is likely that the strain 3.5.1 represents a new Pantoea species. Here, we present the genome sequence of Pantoea sp. strain 3.5.1. The 4,964,649 bp draft genome consists of 23 contigs with 4,556 protein-coding and 143 RNA genes. Genome sequencing and annotation revealed two phytase genes and putative regulatory genes controlling its activity. Up to 90 % of natural phosphorus in the World is present in the form of phytic acid or phytate and is often accumulated in livestock feces. This form of organic phosphorus cannot be utilized by monogastric farm animals and ends up polluting soils and contributes to the eutrophication of water environments [1, 2]. Moreover, phytate reduces the nutritional value of feeds because it chelates essential minerals such as calcium, iron, zinc, magnesium, manganese, copper and molybdenum . Chemical (acid hydrolysis ion and exchange) or physical (autoclaving) methods to hydrolyze phytate are costly and reduce the nutrient value of feeds. Therefore, the search for of alternative methods of phytate hydrolysis is an important task. In light of this, identification and isolation of bacteria capable of enzymatic phytate hydrolysis is a promising approach that would simultaneously reduce environmental burden caused by current agricultural practices. Phytases are specific group of phosphatases capable of phytate (myo-inositol 1,2,3,4,5,6-hexakisphosphate) hydrolysis with the formation of less phosphorylated inositol derivatives [4, 5]. There are a few reports on phytase-producing microbes from Russia; they include fungi [6, 7] and bacteria [5, 8, 9]. Here, we characterize a phytase-producing strain 3.5.1, present its classification and describe a set of its features along with the annotated genome sequence that provides important insights into several candidate genes involved in phytate hydrolysis. Strain 3.5.1 was isolated from a forest soil sample on a selective medium containing calcium phytate as the only source of phosphorus. The genus Pantoea , within the Enterobacteriaceae family, consists of several species ( P. agglomerans , P. ananatis , P. dispersa , P. vagans and others) that generally inhabit numerous ecological niches, including plants, water, soil, humans and animals. Classification of these species had a long history before they were separated in the new Pantoea genus . P. agglomerans (formerly Enterobacter agglomerans ) and P. dispersa were proposed as the first Pantoea species based on their DNA–DNA hybridization relatedness. Mergaert et al. proposed the name P. ananatis for Erwinia ananas . Brady et al. isolated P. agglomerans -like strains and separated them into four novel species ( P. vagans , P. eucalypti , P. deleyi and P. anthophila ) based on MultiLocus Sequence Analysis and amplified fragment length polymorphism analysis . Identification of Pantoea species through their nutritional characteristics or biochemical approaches has proven to be difficult. Currently, several strategies based on the use of genomic approaches have been reported to define Pantoea species [13–16]. One of challenging approaches to construct the phylogenetic relationships among different bacterial isolates is a whole genome sequencing . To date the NCBI database contains information about nine of 23 validly published Pantoea species genome assemblies. Strain 3.5.1 was isolated from the forest soil near Agerze village, Aznakaevo district, Republic of Tatarstan, Russia [18, 19]. The isolate was characterized as Gram-negative, motile and rod-shaped bacterium 0.5 μm to 1.5 μm length (Fig. 1 and Table 1). Colonies were round, smooth and shiny after incubation at 37 °C for 24 h. Longer incubation (2–3 days) of the isolate resulted in production of yellow pigment. The strain 3.5.1 displayed phytate-hydrolyzing activity on PSM solid medium (2 % Glucose, 0.4 % Sodium phytate, 0.2 % CaCl2, 0.5 % NH4NO3, 0.05 % KCl, 0.05 % MgSO4 × 7H2O, 0.001 % FeSO4 × 7H2O, 0.001 % MnSO4 × H2O, 3 % Agar, pH 7.0), i.e. it was able to form halo zone around the colonies (clear zone reflecting solubilization of Ca-phytate in the agar medium) (Fig. 1A) [20, 21]. Thus, strain 3.5.1 has the unique characteristics of degradation of phytate and can potentially be used for the industrial production of microbial phytase; the enzyme could possibly be applied as phosphorus-mobilizing agent in soil or as a feed supplement for livestock production. Strain 3.5.1 was shown to be able to utilize the following carbon substrates: glucose, lactose, maltose and mannitol without gas formation, but unable to oxidize urea (tested on Kligler Iron Agar, Olkenitski's medium and Hiss media) [22, 23]. By API-20E test (bioMerieux, Inc.) it was shown that the strain 3.5.1 cannot utilize ornithine. The strain is resistant to tetracycline, chloramphenicol and erythromycin but susceptible to beta-lactam antibiotics like ampicillin and penicillin. These morphological and biochemical properties are consistent with the notion that this isolate likely belongs to the family Enterobacteriaceae . The taxonomic position of the strain 3.5.1 was first evaluated by the comparison of 16S rRNA gene sequences with related sequences using blastn (nr/nt GenBank Database). The sequence showed 99 % identity to multiple 16S sequences from Pantoea species ( Pantoea spp., P. ananatis , P. vagans , P. agglomerans , P. conspicua and others). More detailed phylogenetic analysis of the strain 3.5.1 was performed using MEGA 6.0 software  with 16S rRNA gene sequences of 21 Pantoea species and 2 Escherichia coli strains as an outgroup (a complete/scaffold level genome sequences for all these species are available in NCBI database). However, our alignment allowed comparison of only variable regions V3 and V4 of 16S rRNA gene for these set of species, because not all completed sequences of these genes are available. Therefore, we eliminated several species from phylogenetic comparison to generate a tree based on the extended variable regions of 16S rRNA gene [25, 26]. Finally, 14 Pantoea species and 2 Escherichia coli strains were aligned, the incomplete sites on both 5′- and 3′-ends of the 16S rRNA gene sequences were excluded from the alignment. The remaining alignment sites (1208 bp), which included V1–V8 regions of 16S rRNA sequences, were selected for the subsequent analysis. Phylogenetic tree was generated using the Maximum likelihood (ML) algorithm with 1,000 bootstrap iterations (Fig. 2). As expected, two strains of E. coli (K-12 substr. MG1655 and O157:H16 Santai) could be clearly distinguished phylogenetically from species that belong to Pantoea genus. P. ananatis and P. stewartii belong to two different clades of the tree with high bootstrap support. However, certain clades, such as P. agglomerans , P. vagans and Pantoea sp., do not form clearly separate groups. Interestingly, despite the fact that the strain 3.5.1 forms a distinct node with P. agglomerans Eh318 and P. vagans C9-1, P. vagans species do not show motility at 37 C° and both with P. agglomerans strains are not able to hydrolyze lactose as a carbon source, unlike the strain 3.5.1 . We also carried out the matrix-assisted laser-desorption/ionization time-of-flight MS protein analysis for the strain 3.5.1 using a Microflex spectrometer (Bruker Daltonics, Leipzig, Germany). Measurements were made as previously described . Spectra of the strain 3.5.1 were imported into the MALDI BioTyper software (version 2.0; Bruker) and analyzed by standard pattern matching (with default parameter settings). The commercially available Bruker database contains 26 protein profiles of Pantoea species and 14 protein profiles of E. coli species. All these profiles were used as reference data to compare the strain 3.5.1 spectra. Strain 3.5.1 showed log (score) values between 1.6 and 2.0 which allowed defining only its genus identification. The 3.5.1 spectra obtained are shown as a dendrogram in Additional file 1. We then calculated average nucleotide identity values between the genome sequences of the strain 3.5.1 and 21 Pantoea species using the JSpecies software  based on the BLASTn method (ANIb) and the MUMmer algorithm (ANIm). Analysis of the 3.5.1 genome data yielded low ANI values (ANIb 74.88-85.11 % and ANIm 83.72-86.86 %) indicating that the strain 3.5.1 does not belong to previously characterized species (Additional file 2), since the lowest threshold for ANI clustering is 97 %. Since the strain 3.5.1 differs from known Pantoea species both biochemically and phylogenetically we designate our isolate as Pantoea sp. 3.5.1. The genome of Pantoea sp. strain 3.5.1 was selected for whole genome sequencing because of its ability to produce phytase. Comparison of the strain 3.5.1 genome with other Pantoea species may provide insights into the molecular basis of phytase activity and metabolic features of this strain. The high-quality draft genome sequence was completed on March 27, 2015 and was deposited to GenBank as the Whole Genome Shotgun project under the accession number JMRT00000000 (current version JMRT00000000.2) and to the Genome OnLine Database with ID Gp0114842 . A summary of the project information is shown in Table 2. The Pantoea sp. strain 3.5.1 is deposited to the Russian National Collection of Industrial Microorganisms (VKPM) under the accession number В-11689. For genomic DNA isolation bacterial culture was grown overnight in 25 mL LB medium at 37 °C with vigorous shaking. DNA was isolated using a Genomic DNA Purification Kit (Fermentas). DNA purity was tested by gel electrophoresis (1 % agarose gel) and DNA concentration was estimated by the Qubit 2.0 Fluorometer using the Qubit dsDNA (High Sensitivity) Assay Kit (Life Technologies). The genomic DNA of Pantoea sp. 3.5.1 strain was sequenced with 32-fold overall genome coverage by a whole genome shotgun strategy. Two single-end libraries were used: a 200 bp-library for Ion Torrent PGM sequencing (performed in the Research Institute of Physical Chemical Medicine, Moscow, Russia) and 600 bp library for 454 GS Junior sequencing (performed in the Interdisciplinary Center for Proteomics Research, Kazan, Russia). Sequencing of the 200 bp library generated 349,046 reads, while sequencing of the 600 bp library generated 152,266 reads. Both read sets were assembled de novo using the SPAdes 3.5.0 assembler . This strategy resulted in 23 contigs (>500 bp) with a calculated genome size of 4,964,649 bp and G + C content of 55,77 mol %. The N50 size of the resulted contigs was 562,444 bp. Genes of Pantoea sp. 3.5.1 strain were identified using the Prokaryotic Genomes Automatic Annotation Pipeline. The predicted CDSs were translated and analyzed against the NCBI non-redundant database, iPfam, TIGRfam, InterPro, KEGG, COG and IMG databases [31–36]. The genome sequence was also uploaded into the RAST system  to check the annotated sequences. The draft assembly of the genome consists of 23 contigs with the fragment size lager than 500 bp, N50 is 562,444 bp. Of the 4,699 genes predicted, 4,556 were protein-coding genes and 143 were RNA genes. Putative functions were assigned to the majority of the protein-coding genes (96.96 %), while the remaining ORFs (open reading frames) were annotated as hypothetical proteins. The distribution of genes into COGs functional categories is presented in Tables 3 and 4. Most phytases of the family Enterobacteriaceae family belong to the group of histidine acid phosphatases as judged by their sequence and properties. Three phytase subgroups (AppA-related, Agp-related and PhyK phytases) can be identified within histidine acid phytases based on their substrate specificity and specific activity levels . To gain insight into the phytate-degrading activity of Pantoea sp. 3.5.1 strain, we analyzed its genome for the presence of key genetic factors responsible for phytase activity of Enterobacteriaceae . We detected genes for glucose-1-phosphatase and 3-phytase which are located on the first contig of the assembly (Additional file 3). However, no sequence homology was observed for an appA-related gene. Sequence analysis of the 3-phytase gene from Pantoea sp. 3.5.1 revealed maximal homology (77 % nucleotide identity) to phyK gene of P. vagans C9-1. A high degree of homology of glucose-1-phosphatase gene of 3.5.1 strain was found to glucose-1-phosphatases (agp) of P. vagans C9-1 (84 % nucleotide identity), Plautia stali symbiont (82 %), P. ananatis strains and P. rwandensis ND04 (81 %), Pantoea sp. At-9b (80 %), and E. coli 042 (72 %). Therefore, we show that Pantoea sp. 3.5.1 harbors two phytase-encoding genes (agp-related and phyK phytases) but lacks appA-like phytase genes. There is still very little information available in regards to the regulation of phytate-degrading gene expression in bacteria. To date, regulation of two periplasmic phytases of E. coli (agp-encoded acid glucose-1-phosphatase and appA-encoded 3-phytase) have been described in great details . Gene agp is constitutively expressed whereas expression of appA is induced by phosphate starvation and by transition to stationary phase. Gene appA is located within the appCBA operon and its regulation occurs by two inducible promoters. We compared phytase genes, their position and context in the Pantoea sp. 3.5.1 genome with agp and appA genes of E. coli . Neither Pantoea sp. 3.5.1 phytase genes (agp and phyK) have similar locations to genome context of E. coli but are comparable with P. vagans C9-1 genome context. However we identified two genes which can possibly participate in the regulation of phytase activity similar to the situation in E. coli : the rpoS gene (RNA polymerase sigma factor RpoS) and araC-like gene (DNA-binding domain-containing protein which belongs to the AraC/XylS family). These regulatory genes are active in anaerobic conditions, phosphate starvation and during entry into stationary phase. Thus, the mechanism of phytase activity regulation in Pantoea sp. 3.5.1 might be similar to E. coli . Figure 3 shows the results of full genome comparison between the Pantoea sp. 3.5.1 strain and P. vagans C9-1 using BLAST Ring Image Generator comparison tool . We also designated the local positions of two detected phytase genes and its possible regulatory genes. Regulation of intracellular phytase activity has also been investigated in rhizospheric strain of Serratia plymuthica IC1270 . It was shown that the GrrS/GrrA system (also known as GacS/GacA and BarA/UvrY) and RpoS factor are implicated in phytase production in S. plymuthica . Both genes of GrrS/GrrA two-component signal transduction system were also predicted in genome assembly of Pantoea sp. 3.5.1. In the current study, we characterized the genome of the Pantoea strain 3.5.1 that was isolated from soils of the Republic of Tatarstan, Russia. The strain exhibits high phytate-degrading activity. Phylogenetically the Pantoea strain 3.5.1 is positioned between P. agglomerans and P. vagans , but the strain 3.5.1 is characterized by phenotypic differences. Thus, it is likely that this strain represents a new Pantoea species. In order to improve the understanding of the molecular basis for the ability of Pantoea sp. 3.5.1 strain to hydrolyze phytate we performed detailed genome sequencing and annotation. We also identified three regulatory genes encoding transcriptional factors. We are grateful to Dr. Lydia M. Bogomolnaya and Dr. Eugene V. Shakirov for insightful discussions and correction of the manuscript. We thank the genomic laboratory staff of the Research Institute of Physical Chemical Medicine, Moscow (Russia) and the Interdisciplinary Center for Collective Use of Kazan Federal University, Kazan (Russia) for whole genome sequencing. We also thank Vladimir G. Evtugyn (Interdisciplinary Center for Analytical Microscopy, Kazan Federal University, Kazan, Russia) for excellent technical assistance with transmission electron microscopy. The research was performed using the equipment of Interdisciplinary centre for shared use of Kazan Federal University, which is supported by The Ministry of Education and Science of the Russian Federation (ID RFMEFI59414X0003). This work was financially supported by the subsidy allocated to Kazan Federal University for the state support of scientific activities [project №14-83 0211/02.11.10083.001], by the Russian Foundation for Basic Research [project no. 12-08-00942a] and by the Government of Russian Federation [grant 074-U01]. This work was performed in accordance with the Russian Government Program of Competitive Growth of Kazan Federal University. ADS carried out the strain 3.5.1 isolation, performed the laboratory experiments and together with EAB and AAT conducted the phylogenetic studies. AAT drafted the manuscript. SVK assembled and annotated the genome. AMM, NPB and MRS developed the study concept and contributed materials and analyses. All authors read and approved the final manuscript.